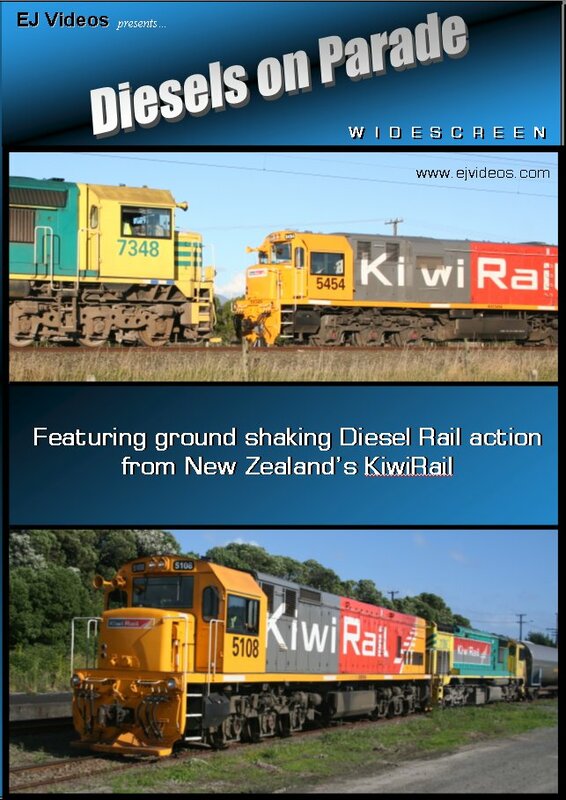 2010 saw KiwiRail continue with its high paced turnout of locomotives repainted into the new “Kiwi Bold” livery. Of note were the number of EF’s now appearing on the main trunk with their new paint job. This rapid turnout of the re-painted fleet and the subsequent constant exposure of the new livery, has the KiwiRail brand firmly established in New Zealanders vocabulary. This production continues our railfanning adventures along the main trunk with the action kicking off at Bunnythorpe and proceeding north through Feilding, Marton, Porewa, Hunterville, Mangaweka, and Utiku to Taihape and features a mixture of intercity freights, milk trains and The Overlander - all being hauled by electrics and diesels. 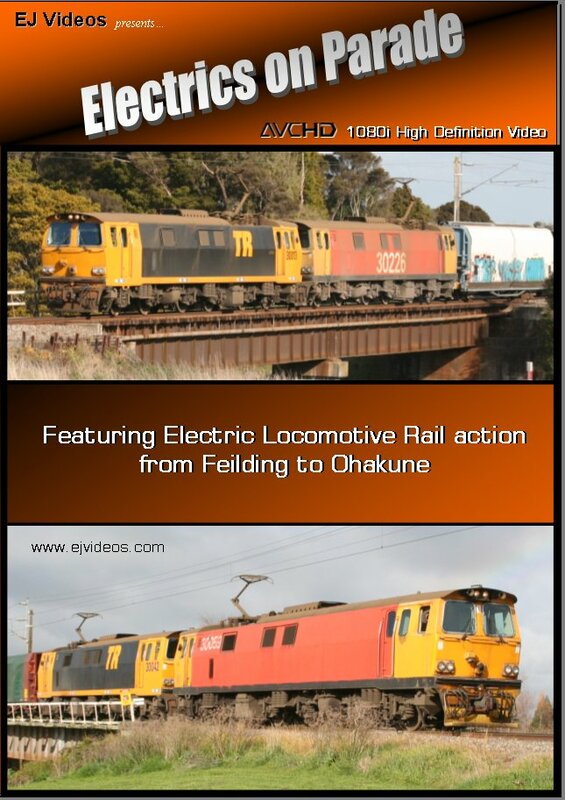 Electrics on Parade is 60 minutes of rail action from Feilding to Ohakune featuring New Zealand's KiwiRail Class EF Electric Locomotives hauling freight and passenger trains between Wellington and Auckland. The EF's, originally designated Class 30, were introduced in 1988 - 89 and despite their age, have proven to be a worthy locomotive ideally suited to New Zealand's unique conditions. They show little outward signs of strain getting up to track speed and make the tough job of hauling 50 plus freight cars through the central North Island's numerous curves and inclines look easy. This production features freight and passenger trains making numerous run-by's, as well as a few pacing shots and many night shots filmed under floodlights. Flaunting its new livery, and with justifiable pride, New Zealand's KiwiRail has embarked on a challenge to re-brand its loco fleet and bring it into line with its new corporate image. 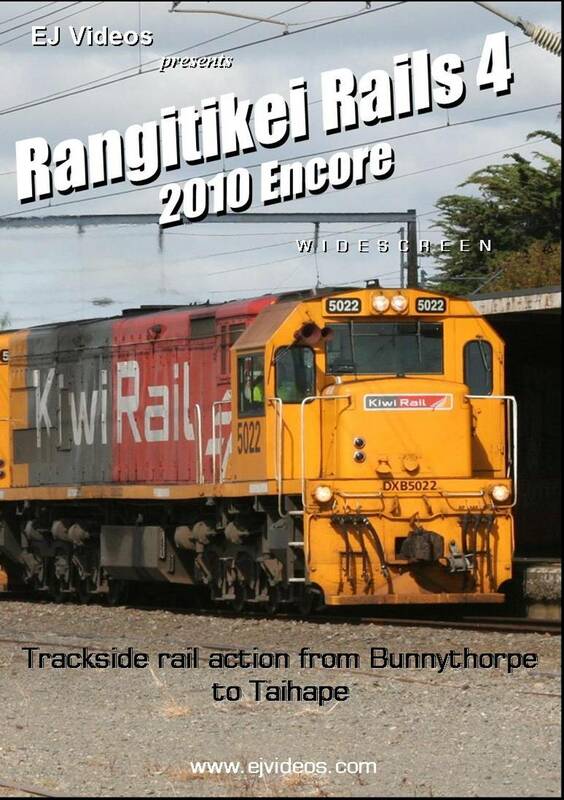 Diesels on Parade is 60 minutes of ground shaking diesel rail action from the Tararua, Manawatu, Rangitikei, Wanganui and Ruapehu districts and features many locos in the KiwiRail livery. Featured are the seasonal milk trains and the ever present mixed freights. 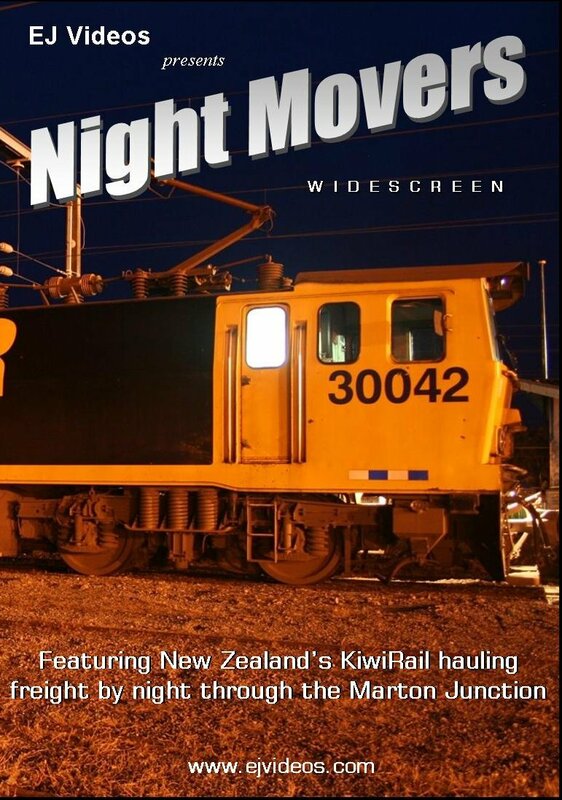 From bright, sunlit skies to golden sunsets to floodlit night shots, this compilation features KiwiRail doing what it does well. Kids love this one. The installation of new platform security lights at the Marton Junction has had the added advantage of providing photographers with a source of bright, white light that is ideally suited to night time photography. Even in the middle of the night, the Marton Junction can be a busy place, with many trains meeting here or passing through within minutes of each other. In this production you’ll witness several meets, including a three train meet. The New Plymouth to Auckland freight now runs through Marton, with a juggling of locos required to head this train back in the opposite direction towards Auckland. All this action and more is captured under bright, floodlit conditions. This program literally sees KiwiRail’s freight trains in a whole new light; with the distraction of scenery, traffic, people and other objects removed, the focus is solely on the trains. 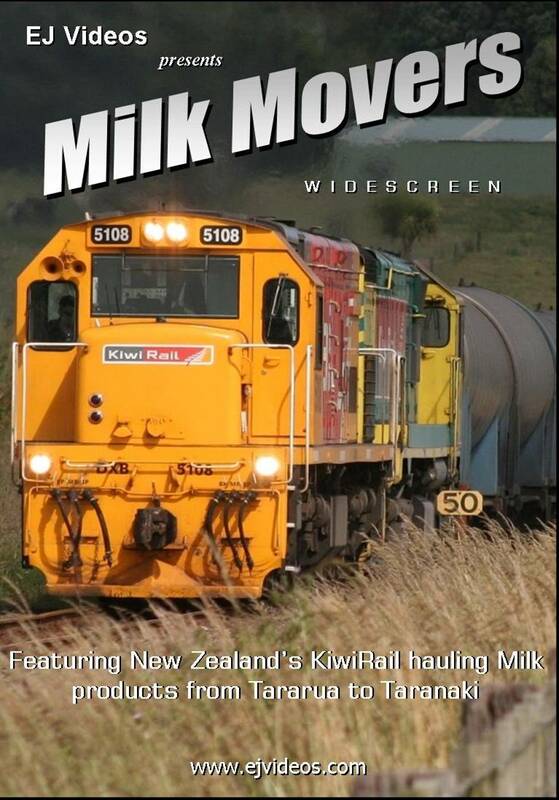 Railways excel at moving bulk goods, and KiwiRail is no exception when it comes to moving milk products. Using its customised Class OM freight wagons fitted with stainless steel tanks, these dedicated milk trains are a common sight during the summer peak milk season. Loaded tanks from outlying plants are assembled into unit trains at Palmerston North and heralded off to Fonterras's plant at Whareroa, near Hawera. During the seasonal peak, up to six trains a day, seven days a week depart Palmerston North for Whareroa, and mixed in with these unit trains are empty containers and ice liners, which will return to Palmerston North loaded with processed products for export. It's busy times ahead for KiwiRail, and you'll see all the action trackside from the Oringi plant through the Manawatu Gorge to Palmerston North and Feilding, Marton, Wanganui, Patea and Whareroa.